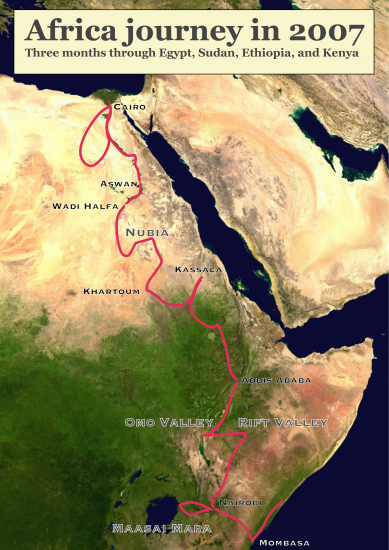 The idea for the journey through Africa was to follow the Nile. From the mouth of the Nile in Egypt up the river and into Sudan, at the confluence of the White Nile and the Blue Nile in Khartoum eastwards and to the source of of the Blue Nile in the Ethiopian Highlands. The source of the White Nile is Lake Victoria which I reached after travelling through the Rift Valley in Ethiopia and Kenya. The map shows the itinerary of that 3 months trip. I will add some of the pictures from the trip.